As full-time travelers, we understand how important it is to have the best resources in every aspect of trip planning and traveling. Whether you're looking for cheap flights, an epic pre-planned adventure, the best way to deal with your money while traveling, or simply an awesome product that will make it easier for you to pack, we have something for everyone. These are the must-use travel websites and services and must-have gear, gadgets, and apps that make our travel lives easier, cheaper, and more FUN! There's an art to finding discounted flights. Here are a few of our favorite resources. Momondo is an incredible flight comparison site that searches airlines world wide, including budget airlines. We always shop on Flight Hub to make sure we are getting the best flight deal. One of our favorite sites to compare prices. We love the month-at-a-glance view option to compare prices for a range of travel dates. Such an incredibly easy site to use to find cheap flights! Use these links to find awesome deals on hotel stays around the world. Over 300,000 properties in 60 countries, Hotels.com has some incredible deals with no change or cancellation fees. An awesome way to compare hotel prices of 225,000 properties in 225 countries! You can book great deals on accomodation on the webs best pier review travel site! Want something a little more homey while you're on the road? Yeah, we don't blame ya. Stay in one of 2000+ unique, off-beat properties around the world. Great way to live like a local in a home or apartment. Rent full properties or spare bedrooms. Use this link for $40 off your first reservation. Stay with a local in their home and get to experience a new location in a unique way. Over 50,000 hosts in 150 countries! Resources for getting around once you get to your destination. Use the Lyft app to get around town quickly in real peoples vehicles. Use this link and enter promo code NEWUSER10 for $5 credit per ride for 2 rides for new users. Incredible resource page for overland or overwater travel. Find out how to get anywhere overland. 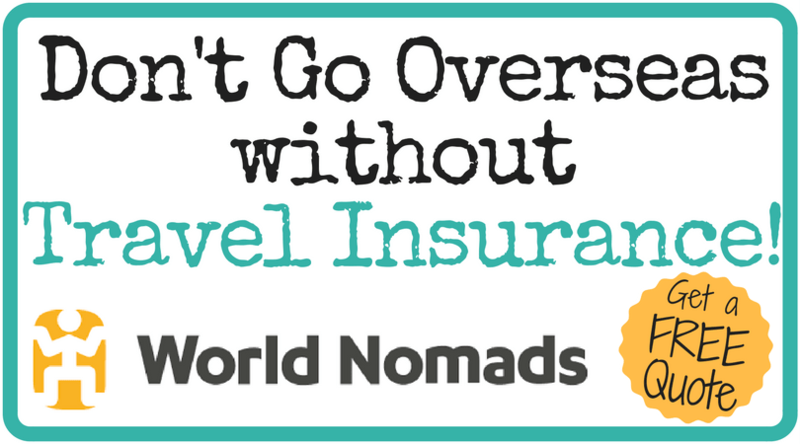 Seriously, don't even think about going overseas or traveling abroad without securing travel insurance. There are so many options to suit any budget or itinerary, that vacationing without insurance is not smart. Trusted insurance provider with affordable rates, and designed with adventure seekers in mind. Compare many policies with varied coverage levels. They offer per-trip, or year-long policies, as well as policies that allow you to "cancel for any reason"
Search and compare travel insurance from many providers with custom search filters, and amazing customer service. What do you do when you get to a new destination? Explore of course! Here are some unique companies that will help you make the most out of any trip. Available around the world. See a city with a local! Eat & drink like the locals, or learn to cook like the locals. Many individualized experiences available to get you off the beaten path and have an authentic experience. Discounted pre-paid admission to top attractions in 11 major cities around the U.S. and Canada. Skip the lines and have more fun. For the adventure junkies - find tons of adrenaline fueled activities around the U.S. at a discounted price. When we are home in the United States, we are traveling and living full-time in a travel trailer. It's a very unique and fulfilling lifestyle of adventure and minimalism. These are some of our favorite resources to make it happen. We will be adding to this list periodically. Thinking of going off-grid in your RV? Goal Zero is the most respected name in easy-to-use solar products for RV and home use. A free site for finding campgrounds (free and paid) as well as user submitted photos and reviews. Membership club that gives valuable discounts on products, services, gas, etc., that every RV enthusiast needs. Worth it. Awesome database of free places to camp off-grid overnight. Also known as boondocking. While we personally prefer individual trip research and planning, we also realize that individual travel isn't for everyone. Meeting other travelers and exploring as a group without the stress of planning is a huge draw for many people. Here are some of our favorite vacation companies offering you the trip of a lifetime. Group adventure trips for budget minded people who would rather spend time traveling and not planning. Dozens of pre-planned, air-inclusive, affordable vacation packages around the world. Great for couples vacations. Choose from dozens of unique and themed trips. The #1 go-to for affordable cruise booking because all they do is cruises. They have a Best Price Guarantee and no booking fees. Fun vacation packages for 18-35 year olds. Great if you want to travel with others, and don't want to worry about planning. Short on time and money? Orbitz has incredible deals on pre-packaged flights & hotels for quick get aways. Travel guides, airport parking, passports, visas, etc. Theres's a lot to think about when planning a trip. Let these guys help. When you can't find a ride to the airport. Park 'n Fly picks you up at your car and drops you at your terminal. Affordable prices with no hassle. Need a passport, or expedited service? G3 has many services to choose from to get you on the road without hassle. 24 hour turn around time for passport or visa. Fast and affordable service when you're in a rush! Our choice for destination guidebooks. Good for getting to know a location and on-the-spot reference. Dealing with money while traveling can be confusing, frustrating, and expensive. Here are some resources we highly recommend to get the most bang for your international buck. Purchase up to 60 different foreign currencies ahead of time. Have it delivered to your house or pick up at a location near you. Get a great exchange rate. No fees. Load a card with up to 6 currencies before your trip to lock in a great exchange rate. No ATM fees, and not attached to your bank account. Peace of mind when traveling abroad. Tired of paying ATM fees abroad? Open a Charles Schwab account and be reimbursed for any foreign ATM fees. Use this link and get $100 back when you sign up. We use Charles Schwab when we travel. There is nothing in this offer for us, just you. These are some of the items we use and love and do not travel without. They are all Amazon Affiliate links. If you purchase through these links, there will be no added cost to you, but the commissions earned will help support the increasing costs of running this blog. Thank you. Pacsafe Citysafe Anti-Theft Travel Handbag This is the exact handbag I carry with me on a daily basis when I'm traveling. The material cannot be cut, and neither can the strap. The zippers are protected and cannot easily be unzipped. Pacsafe Coversafe Anti-Theft RFID Blocking Waist Wallet We both have one of these money belts to wear under our clothes for safekeeping of credit cards, cash, and passport. The material and strap cannot be slashed. Lumintrail TSA Approved Combination Travel Lock with 4' Steel Cable We always use luggage locks when we are in transit or leave our bags unattended at all. On trains and buses (even some hotel/hostel rooms) we will use this cable to secure our bags to something sturdy. Works like a charm. Earth Pak -Waterproof Dry Bag - Roll Top Dry Compression Sack Keeps Gear Dry - With Waterproof Phone Case These come in various sizes and colors. We have both a 5L and a 15L sack and we take them on every trip we take and use them constantly. Good for any activity on or near water. This one comes with a phone/creditcard case that we highly recommend getting as well. Shacke Pak - 4 Set Packing Cubes - Travel Organizers with Laundry Bag Literally, the only way we can stay organized when living out of a backpack is because of these packing cubes. They're durable, and will keep you sane when packing and unpacking over and over again. The included laundry bag is helpful as well. Belkin Mini Surge Protector with USB Charger We will never NOT travel with at least one power strip again. With numerous gadgets and cameras that need to be charged, usually the amount of outlets available in developing countries is never enough. Charge everything at once. Small in size and with multiple USB ports, it's super convenient. Power Bank RAVPower 26800 Portable Charger 26800mAh Total 5.5A Output 3 USB Ports Battery Pack Traveling with a portable power source is a great idea, especially if your cell phone is like ours and doesn't hold charge anymore. This device will charge an iPhone 7 up to 9 times, just to give you an idea of its power. Perfect for long periods of travel, or camping, or simply if you use your phone a lot. Seagate Backup Plus Slim 2TB Portable External Hard Drive USB 3.0 This is the exact portable harddrive that we take traveling with us to back up photos and videos on the go. Would be a shame to lose or drop your phone or camera and lose all the footage. Regular backups are important. And this device is very small and portable. MAXAH All in One Universal Worldwide Travel Wall Charger AC Power AU UK US EU Plug Adapter Adaptor Don't get caught somewhere in the world searching the local shops for a plug converter. Bring one ahead of time. This is the one we take with us to Asia. Some countries with unusual plugs (like, South Africa) may not be available online and are best to be purchased upon arrival. We also use these other travel essentials. Please click below to browse. So many apps, so little time (and room on our phones). Here are a few we use. Must-have app for searching cheap flights on the go. For IOS. Must-have app for searching cheap flights on the go. For Android. Search for the best hotel deals. Or use the new concierge service to also book rides, order food, and get tickets. Very handy! If you found this guide helpful, please share to your Pinterest with this ready-to-pin image! We send a monthly newsletter with exclusive discounts and content only for our subscribers. Don't miss out! Be sure to check your email and confirm this subscription. After that you will receive our official welcome email.